Reversi (a.k.a. 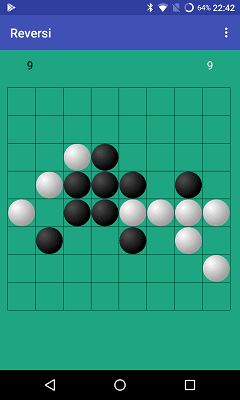 Othello) is a board-game based on a grid with eight rows and eight columns, played between you and the computer, by adding pieces with two colored sides. Each player must place a piece in a position that there exists at least one straight (horizontal, vertical, or diagonal) line between the new piece and another piece of the same color, with one or more contiguous opposite pieces between them. Black color starts first move. 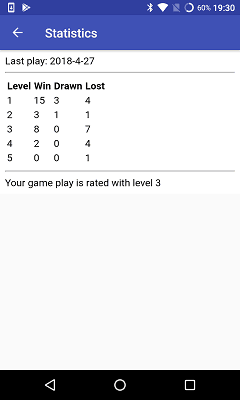 Further information about game play can be found in Reversi. The main screen shows the Reversi board with black and white pieces. The number of pieces of each player is displayed in the top row, black player on the top right and white player on the top left side. The black player starts first move. Just touch on a free place, near to the opposite color. In case you want to undo your move, just press the back button. Note that statistics are not recorded for games during which you change settings (e.g. game level), in case you use the Hint feature and in case you press the back button during a game. 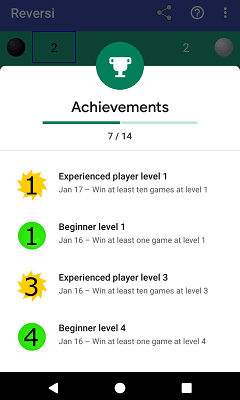 Unlock achievements by winning games at each level. Achievements have experience points (XP) associated with them. Prove your ability by unlocking achievements! 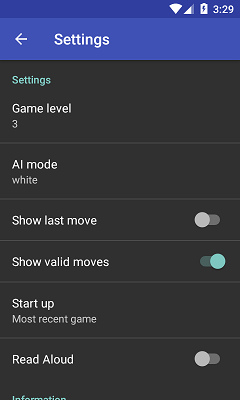 Note that achievements are not unlocked for games during which you change AI mode or you use the Hint feature or you press the back button during a game. You can see how well you are doing compared to your friends and the rest of the world by looking at leaderboards. General leaderboard: it shows the score of each player. 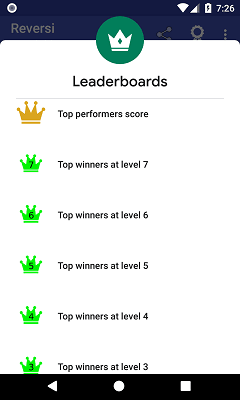 Level specific leaderboard: it shows the number of games won by each player at that level.